Keep your tablet safe from scratches and marks with this crochet tablet cover, make sure yours is unique and stands out from the crowd by crocheting in your own color scheme, I have made it in light worsted yarn with a hdc, sc repeat, It is a really quick and fun sleeve to make and would also be great for a birthday gift etc. See also my Raised Tablet Cover. Pull up loop from each of next 2 stitches, yo pull through all loops. Row 3 – ch1, 1sc in base of ch1, * 1hdc in next hdc, 1sc in next sc, * rpt from * to * to end. Turn. Place a different color marker at the beginning and end of the last row. Flap – (Dec Row) ch1, 1sc in base of ch1, dec 1sc (see abbrev) over next 2 stitches, work 1hdc in each hdc and 1sc in each sc in pattern as set until last 3 stitches, dec 1sc over next 2 stitches 1sc in last sc. Turn. Rpt Row 2 eleven more times. Turn. Buttonhole Row – rpt Row 2 over next 17st, ch2, skip 1hdc, 1sc in next sc, rpt Row 2 over next 17st. Turn. Next Row – rpt Row 2 over next 17st, 1hdc in ch2 space, 1sc in next sc, rpt Row 2 over next 17st. Fasten off. Small Flower – Click HERE for how to crochet the flower. Finishing – Fold cover up from the bottom to the markers and with WS facing whip stitch sides together to make a pouch. Weave in all loose ends of yarn and trim off, turn through to RS, sew on button to front of pouch to correspond with the buttonhole, attach small flower. Make sure you pin this crochet tablet cover post for when you need it. Hope you enjoy this pattern, have fun until next time. The written instructions and pictures for this free crochet tablet cover pattern are copyrighted to crochet ‘n’ create © 2017. You are welcome to sell the finished products made from the free crochet tablet cover pattern, I just ask that you please use your own pictures and put a link back to crochet ‘n’ create. 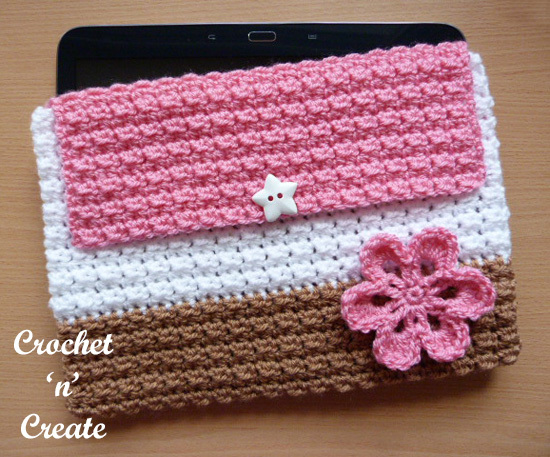 DO NOT share the written instructions for this crochet tablet cover pattern. 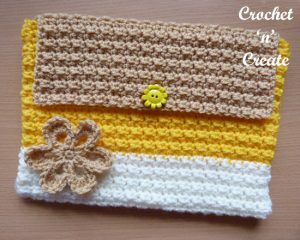 This entry was posted in Bags & Covers and tagged crochet, crochet bags, crochet cozy, free crochet patterns on 29th December 2017 by crochetncreate. I like it, the first one I’d call Neopolitan ice cream. I especially love the colors of the second one. Well done, thanks.